Cold grain salads really hit the spot during the summer. We live on them all summer long! 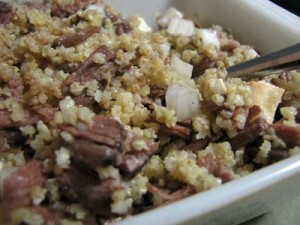 On Saturday evening, I took cold cooked millet and mixed it together with shredded roast beef, goat feta cheese, diced onions, olives, garlic, herbs, salt, pepper, extra virgin olive oil and balsamic vinegar. The dinner was great and cooling on a day that reached 100 degrees. In this post, I'll share a general formula for creating your own cold grain salads, based on the foods your family enjoys and what your pantry contains. Refer to the Grain Cooking Chart (or the Gluten-Free Grain Cooking Chart) for grain/water ratios, along with directions and options for overnight soaking, which is very important to aid in digestion. Chunks of raw cheese – feta, cheddar, etc. The dressing is really up to you. Our favorite is a viniagrette made from extra-virgin olive oil, balsamic vinegar (sulfite-free), salt, pepper, garlic, and herbs. Also good would be a honey-mustard, a natural ranch-type dressing (I'm working on a super good one right now), or a yogurt/kefir based herb dressing. Try one! Let me know what you mix together and how your family likes it! Feel free to share what else you do for cooling eating during the summer. BUT… also add some acid medium to the soaking water. This would be: Kombucha, raw apple cider vinegar, lemon juice, buttermilk, kefir, whey, yogurt, etc. You would use 1 tablespoons per cup of water. Start the soaking the night before, so it is at least 7 to 8 hours. Once you get in the habit of soaking, it is really an easy routine to keep up. 🙂 Let me know if you have questions! Mona, I just updated my comment with a better link for you. I’m writing this just in case you saw the first one, but didn’t know I updated it. I am really looking forward to making this. I have never soaked my grains but have friend that keep encouraging me to do so. I really think I will give it a try! Thanks for the post! .-= Kimi @ The Nourishing Gourmet´s last blog post… $10 Main: Asian Cabbage Salad =-. Kimi – Yumm! What’s yours gonna be? I have a few questions. 🙂 Would you serve this as a main dish or a side dish? It sounds like a meal in itself. Suggestions for accompanying dishes? And do you combine different grains? .-= Marg´s last blog post… Rainy day in the kitchen =-. It was marvelous! My husband told me tonight “This salad rocks.” So perfect for a miserably hot day! .-= Mindy´s last blog post… just desserts =-. I was over here collecting some recipes for the beans portion of the ecourse, and I happened to see your comment that you are working on a super good natural recipe for a ranch-type dressing. Did you ever perfect that? I’ve been trying different variations of my own for a long time now and I would LOVE to know what you’ve put together. It is very flexible, and we like it VERY much!